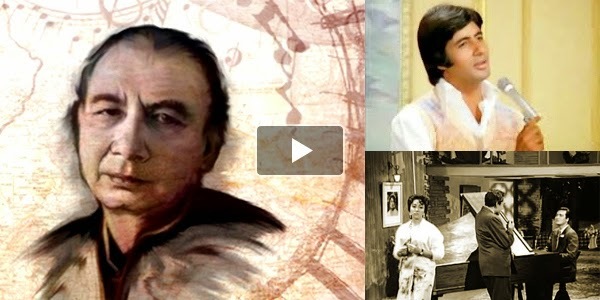 Raaga.com: Sahir Ludhianvi Was Truly A People’s Poet! Sahir Ludhianvi Was Truly A People’s Poet! Where, o where are the preservers of pride! Those who’re proud of the orient, where are they? What soul stirring words and what a potent decry about the plight of the prostitution and the hallow pride of the national makers! These hard hitting words are of Indian cinema’s most brilliant and probably the most popular and highest poet SahirLudhianvi, the same lyricist whom the younger generation remembers for his immortal hit song kabhi kabhi mere dil mein khayal aata hai… picturised on heartthrob of millions Amitabh Bachchan in Yash Chopra’s KABHI KABHI. Pal do pal meri hasti hai; Pal do pal meri jawani hai…. Sahir’s madness for the poetry and his nation was so touching that for the sake of poetry he never married for he believed that besides love there are many more things in this world for which he is born. Hence he rightly wrote …. My heart goes out to others too). SahirLudhianvi wasn’t merely a revolutionary poet, but a poet sensitive to the human condition, hence he was fondly called People’s Poet. Raaga.Com pays our humble homage to the majestic poet!